In a saucepan, combine milk, cream, cinnamon, vanilla extract and nutmeg. Bring to the boil over medium heat. Once boiling, remove from the heat and allow to steep. In a large bowl or stand mixer, beat egg yolks and sugar until combined and thick ribbons form when the whisk is lifted. Slowly whisk in the milk and continue to mix until the mixture is combined and smooth. Add bourbon or rum, and stir. Refrigerate overnight or for up to three days. Before serving, add cool whip to the top and garnish with freshly grated nutmeg or cinnamon. Tip â If you donât have cinnamon sticks, simply use the powder. 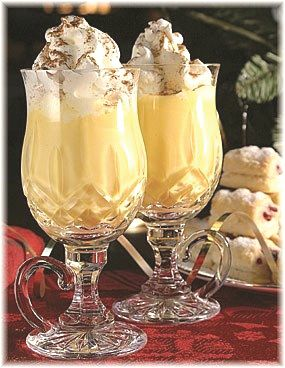 For a virgin egg-nog, donât add the alcohol. In a mixing bowl, whisk together egg-nog, eggs, nutmeg and rum extract until very well blended. Dip bread in mixture, making sure it is completely saturated. Place bread in frying pan on medium heat, so as not to burn, and fry until brown and crispy on both sides. Repeat until mixture and bread are finished and serve warm with maple syrup and sweetened whipped cream, if desired. Tip â Feel free to leave out the rum extract.